KGNCFM’s “$1,000 Pile Of Presents” Starts On Monday! 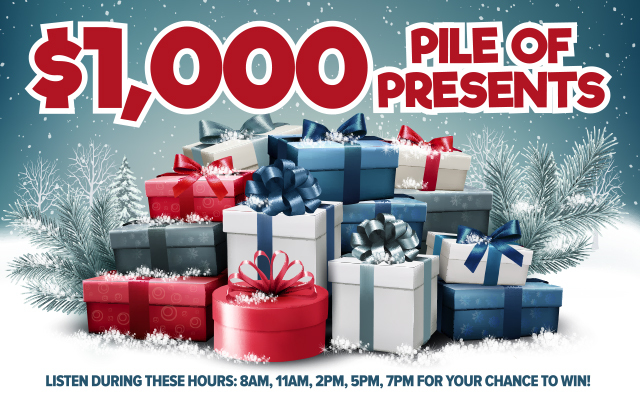 Amarillo’s Country, 97.9 KGNCFM’s “$1,000 Pile of Presents” starts on Monday! Just when you thought we didn’t have much left in our tank, bam! We hit you with another winning opportunity because we’re all about giving away as much as we possibly can during Christmas. Through December 21st, listen for keywords at 8, 11, 2, 5, and 7. Once you hear the keyword, head over to our website, KGNCFM.com and look under the win tab. The more times you enter, the better chance you have at winning. We’ll draw for one grand prize winner who will get hooked up with a $1,000 gift card.